Similarly to the deep dish pizza that I had made in late November, I used Vicolo Pizza organic cornmeal crust pizza shell to make deep-dish pizza. This time, I used tomato paste and Rising Moon Organics' Garlic and Merlot tomato sauce, but then used maybe a cup or bit more of sliced mushrooms to make two pizzas. Like last month, I also put in some vegan Field Roast Grain Meat Company apple-sage artisanal sausage, but didn't grill it and put in a single sausage cut into small chunks, deemphasizing its flavor. I also put in a finely diced shallot and some olives. The pizza was good but I liked last month's version much better. I also served some Potatoes O'Brien - starting with a frozen mix that just needed to be cooked. It's possible that this will be my last cooked dinner for 2007! I was helping a colleague with photography in his studio today and tomorrow will be there again. We're thinking of meeting a friend afterwards for a film and perhaps also to eat out. December 30th is my birthday! We always get together with friends and I rarely cook. Finally, the vegetarian society has a New Year's Eve party with donated vegan pizza from Lilly's Pizza in Raleigh. We're likely to have pies like last year - artichoke hearts, basil, pine nuts, and tomato slices; eggplant, sundried tomatoes, red bell peppers, and pistachios; the "Buddha" with oil, garlic, spinach, zucchini, and olives; the "Queen of Hearts" with oil, artichoke hearts, mushrooms; and onions, banana peppers, and green olives, mushrooms. Most will have VeganRella vegan "cheese", and some will have no "cheese" at all on half. Whether I do get to blog again before the new year or not, I wanted to wish all of my readers a most enjoyable, rewarding, and positive 2008. May it be filled with many great vegan goodies! I made a curried seitan and vegetable dish today. To save time, I used Thai Kitchen brand prepared green curry paste, rather than using a mortar and pestle to blend together the ingredients like ginger (though I added a little coarsely chopped fresh ginger, as well) and hot chili pepper. Into a sauce pan, I poured a small (14 ounce) can of reduced fat coconut milk (I never buy the full-fat milk and find the reduced fat has pretty much the same flavor), six teaspoons of the curry paste, and a package of seitan that I had chunked into bite size. I brought it all to a near-boil then simmered, uncovered, gradually adding a sliced zucchini, half of an onion coarsely cubed, and a sliced red bell pepper, plus a little fresh ginger and a little salt. At the end, I also mixed in some pink peppercorns. I had meant to serve it in a bowl of rice, using up the leftover Surin ruby red jasmine rice from class last week, but decided to serve the liquidy curried vegetables and seitan in a bowl. I also briefly grilled asparagus in walnut oil and served it with salt and pepper. Tonight, my wife got to try the artisinal Pappardelle’s brand lime cilantro linguine that I described almost two weeks ago. I made a simple sauce, starting with Rising Moon Organics' Garlic and Merlot sauce. 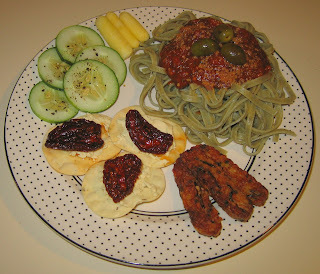 I served some sauteed tempeh and imported Italian Mulini Reali organic hand-rolled rosemary crackers with sundried tomatoes and (omitted for my wife) cheddar-style "Sheese" imported from Scotland. For our Christmas meal, I made a simple dinner, sandwiched in between a fun 19-mile bike ride and going out to see the opening day showing of the cute film Juno. I had purchased an interesting looking prepared dish from Whole Foods Market, Curried Potatoes and Kale. I simply heated it and served it - it was good! Here are the ingredients - I'll try to make something like this soon: potatoes, kale, ginger, garlic, crushed red pepper, curry powder, canola oil, orange juice, carrots, tomatoes, coconut milk, onions, cornstarch, salt, water. I also reheated the sweet potato and leftover limed rice pilaf from last Tuesday. 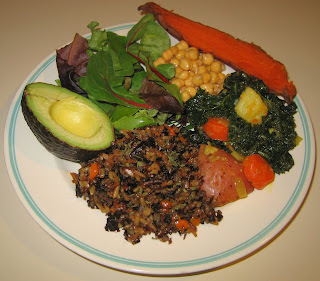 Avocado, salad greens, and sprouted chickpeas rounded out the meal. 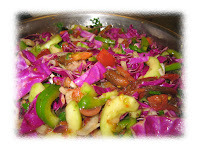 I had most of a cabbage half to use and found my blogger friend Kaji's Mom in Ohio had a nice, simple braised cabbage recipe posted from The Complete Vegan Cookbook. I modified it a bit; I know that the flavor of red cabbage, as opposed to that of most other kinds of cabbage, benefits from slow cooking. a large sauce pan. As the onion softened and started to clarify, I added about 1/2 teaspoon of cumin seeds and let them cook briefly, for about 30 seconds. I then added 1/2 cup of water, the cabbage that I had thinly (1/4"-1/2" x 1 1/2" strips maybe) sliced and which amounted to perhaps 2 cups, 1/2 teaspoon of dried tarragon (an herb I had not cooked with before - I liked its anise flavor and will experiment more with it! ), and a little salt. I just barely brought the water to a boil, then reduced the heat to low-medium and let the cabbage simmer for about a half hour, covered. 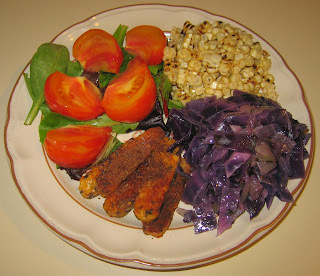 I also served sauteed (in the Fire Oil) tempeh that I then coated with jerk seasoning. I grilled on the gas range flame three ears of corn, stripped the kernels, and mixed in both lime and lemon juice, plus salt and a little leftover jerk seasoning. 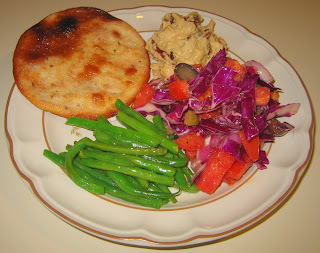 It was a good dinner - the cabbage was soft but still a little crispy and had a good flavor. We came home after having seen an excellent performance of Louisa May Alcott's Little Women by the Young People's Performing Company - great acting! We stopped to shop and I bought, among other items, some rutabaga and a new product (for me), Mulini Reali certified organic hand-rolled rosemary crackers, imported from Southern Italy. I purchased and served raw some rutabaga this past April, but otherwise have no experience cooking with this turnip-like root vegetable. I tossed together about a cup and a half of 1/2" cubes with maybe a dozen halved baby white carrots, a container of seitan that I had cut into 1/2" cubes, a few tablespoons of fresh rosemary needles from my garden, a little salt, and a dash of dried dill, along with a small-medium red Italian cipollini onion that I had cubed into 1/8" pieces and 3 finely diced garlic cloves, in a little bit of Floribbean Foods' Key Lime Savory Oil. I roasted this (single layer on a plate) at 375°F for about 40 minutes. I also put a little bit of walnut oil in a pan and wilted some braising greens by cooking them for just 2 or 3 minutes over medium heat (walnut oil is not meant to be heated for long and gets bitter; it's best cold in salads), and served the greens with a little salt. I served the rosemary crackers as well as heirloom tomato. Dinner was good! The roasted vegetables had a nice slight lemon taste, and the greens were pleasantly a bit bitter. The crackers were good with subtle flavor. The only unfortunate thing about the meal was that we had hoped to have a friend over, but she ended up under the weather. I don't often drink alcohol, but today bought some Bell's Brewery cherry stout (a vegan beer; some alcohol is not strictly speaking vegetarian as it can, for example be clarified with fish products) and enjoyed it with dinner - the cherry flavor was very nice. I also heated a tasty "Pie Oh My!" dark cherry pie for dessert. 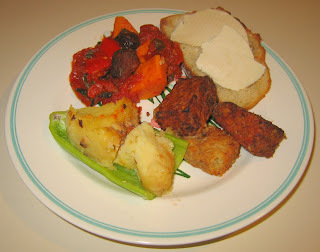 I had some yummy leftover Indonesian stew from class on Thursday, as well as some tasty tomato salad. I came up with an idea that turned out well and which I think would make for a great appetizer or event reception finger food. I sauteed in a little bit of Floribbean Foods brand Key Lime Savory Oil thin squares of tempeh; about two minutes after the tempeh had been added, I put in slices of half of a jalapeno pepper mainly to flavor the oil, but I served one slice on each of our plates atop a longer piece of tempeh. In the final minute or so of the saute, I also put in a flat piece of ginger to cook a little bit, and let pieces of bread soak up the hot oil and get slightly grilled on one side. 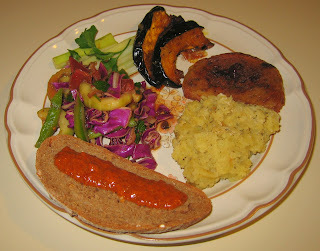 I topped the bread with a little Meditalia brand red pepper tapenade, then the tempeh and ginger. We loved the meal! Yesterday before I went shopping for cooking class, I visited a store that sells imported foods, primarily from Greece. I picked up what looked like pricey but recommended Inés Rosales (named after the baker who made this recipe famous in 1910) brand sweet olive oil tortas (Torta de Aceite) imported from Seville, Spain ("handmade since 1910"), an Andalusian traditional lightly sweetened crispy thin biscuit with anise. I thought that I would serve it with hummus, which is what I did tonight. I made a simple variation on hummus; it's easy enough to make, but I rarely bother as it then requires cleaning the food processor. I purchased some hummus and mixed in strips of sundried tomatoes in oil and herbs, as well as sprouted chickpeas that my wife had prepared in the past few days. I also made a simple Greek salad with purple cabbage, olives, tomato, red onion, olive oil, black pepper, and vegan Parm! "Parmesan cheese"; I would have liked to include some bell pepper, but I was out of peppers. Finally, I served green beans simply, as we learned when we were in Tuscany last year - a quick saute in a little bit of olive oil, followed by some squeezes of a lime, salt, and fresh ground black pepper. Dinner was good. I really liked the torta, though it was a little too sweet to go well with the hummus. I am sure we'll enjoy snacking on the tortas and finishing them up on their own merits in the coming days! I put a bit too much (about 1/5 of a medium red onion) onion in - and we were off for contra dancing immediately after eating! It's difficult to believe that my current six-week cooking class came to a close tonight. As always, it was a very nice set of students. This time, we let one extra person in to accomodate a couple, and had nine students in our not-so-big kitchen. This may have been the tastiest night yet - but then again, this group made fabulous Italian, Mexican, Indian, ... it's tough to choose! We made an Indonesian vegetable stew with noodles, potatoes, mushrooms, broccoli, and a curry paste I showed my students how to make - as always, this came out great and was probably my favorite dish tonight. 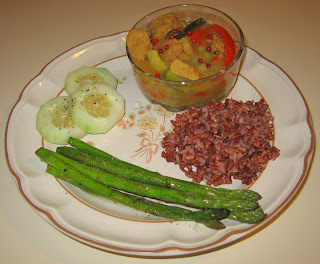 The tempeh was very good, made with various spices and coconut milk. Two kinds of salads hilighted the flavor of Ume plum vinegar - one cucumber with some tomato, and the other a tomato salad - were also good. We usually have a plain Thai jasmine rice, but I have seen fair trade rice by a cooperative named Surin in the store recently, branded/impoted by Alter Eco, and decided to try their ruby red jasmine today. I was also tempted by a purple variety. The ruby red is of the Khao Deng variety and supposed to be particularly nutritious (generally foods that are naturally colorful are especially good for us). It was much tastier than plain jasmine rice and I plan to integrate some of these rices into my regular cooking. We also had cashew chip meltaway cookies that were decadently excellent! Some picked these cookies, while we were eating them warm from the oven, as our best dessert, while others chose the chocolate baklava or blueberry crisp. Yesterday, we had quickly decided to go to the theatre to see what sounded like an interesting Pakistani film Khuda Ke Liye, about the relationship of moderate and fundamental Islam, as its run was ending. Alas, there were no subtitles; I could understand some of the Urdu language, but management allowed me to skip out after an hour or so and catch another film that I wanted to see, the documentary My Kid Could Paint That. I liked the film - it was about a 4-year-old, Marla Olmstead, whose art is seen by some as being prodigious abstract art, and which commands high prices. Marla's website is fun! Anyway, we had barely enough time to call ahead to Udipi South Indian restaurant so that we could eat at the restaurant, enroute and just a mile or so away from the theatre. I had a delicious uttapam (Indian pancake) with vegetables and coconut, and my wife had lemon rice. 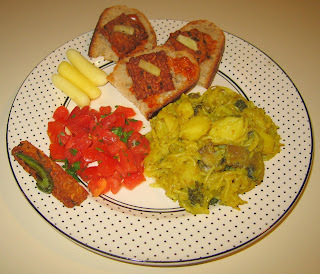 We also had idlis (steamed rice cakes) and pakoras (friend dumplings) as appetizers. We've been eating out the last few nights. My wife performed sitar at a concert in Charlotte on Sunday; she was there since Thursday night, and I took the train on Saturday evening to be with her. We went out after I arrived with several of her friends to Wolfman Pizza, a local chain that we like with many good pizza toppings and nice, thin vegan crust - I think my wife and I shared an artichoke heart / green olive / spinach cheeseless pizza with pineapple instead of spinach on her half. We ended our trip on Sunday eating at probably our favorite Ethiopian restaurant (even more than the ones in Adams-Morgan in Washington, DC), Meskerem. We love Ethiopian food - many vegetarian dishes that somewhat resemble Indian food, served atop a piece of thick, soft, sour injera bread made with fermented teff (a grain). Utensils aren't given - just additional injera (reminscent of Indian dosas) to use with hands to scoop up the food. This restaurant has good service and we're impressed with the cleanliness and decor. Yesterday, I taught a 3-hour photography workshop. We decided to eat out and tried a new place, for us, Fuse. It's run by a nice Korean man and is fairly vegetarian friendly. I enjoyed bee bip bom when I visited Korea a few years ago - a common dish with rice and a variety of vegetables that one mixes together. They had it at Fuse, which we enjoyed, as well as sweet potato fries and salad. Unfortunately, Fuse is also a club - when we got there, we were the only clients, but soon smokers arrived - it's NOT enjoyable at all to eat (or do anything!) around cigarette smoke. Today, I made a pilaf by starting with sauteeing, in the lovely Floribbean Foods Key Lime Savory Oil, a small shallot, cubed 1/8"-1/4"; a minute or so later, I added half of a yellow bell pepper, diced 1/4"-1/2". Another minute or so later, I added approximately a cup of a brown and wild rice mixture and sauteed for about two minutes till the brown kernels starting getting slightly clear. I added a half teaspoon of cumin, stirred for a half minute, then added twice as much water as I had added rice, a cube of vegan bouillon, and half of a dried mulato pepper (I should have also added a half teaspoon or so of salt). I brought it to a boil then simmered it, covered, for about 50 minutes. I served the pilaf inside acorn squash that I had baked, along with baked sweet potato. 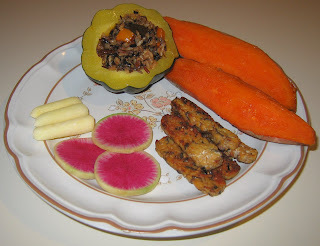 I sauteed some tempeh in the lime oil and served it, along with watermelon radish slices and baby yellow carrots. 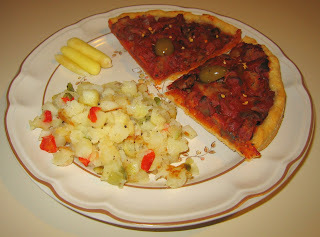 It was a good dinner, but the squash needed a little more seasoning; we added a pinch or so of salt, as well as a teaspoon of Meditalia brand red pepper tapenade. A friend in Seattle sent some fine artisinal Pappardelle’s brand pasta for us, lime cilantro linguine and Spanish saffron trenette (I learned that trenette is the name that Genoans and Ligurians in North Italy use for flat pasta that others call linguine). My wife left for Charlotte (about 2 1/2 - 3 hours away) last night - she had to work there today and is also performing sitar there in town on Sunday morning. So I decided to preview this pasta on my own. I prepared the lime cilantro linguine - I was tempted to try it before I added any sauce or toppings (I simply put a dollop of pesto on top), and it tasted quite nice. Lime sure does good things to food! I also grilled a vegan Field Roast Grain Meat Company apple-sage artisanal sausage. I had a little bit of stromboli leftover from Sunday, and heated it up to round out, along with some broccoli, the meal. Tonight was already the penultimate class 5 of my 6-week cooking class - how time flies! We had a few folks out last time but had a full kitchen of all nine students tonight plus me (I normally cap the course at 8, but had a couple who really wanted to take it together, so allowed one extra) for Indian cooking. 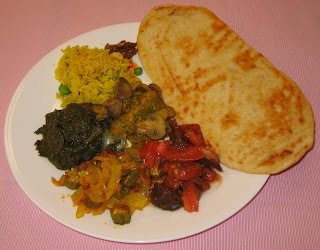 My students made a tasty meal of bhindhi (okra), curried mushrooms, masala hurry mutther pulau (rice and green pea pilaf), palaak tamatar (pureed spinach and tomato), Nanaji's favorite tomato salad (my maternal grandfather's delicious favorite, tomato simply served diced with roasted ground cumin and kala namak - black salt which is actually pink in color), mango shake (we made it tonight with vanilla hemp milk as the base - creamy and good), chai (also with hemp milk), and two types (one with walnuts, one without) of chocolate tofu pies. I used to teach this class years ago in Raleigh and it was then two weeks longer. I have never been fond of Indian sweets, so in this shorter class, bring in American desserts to the Indian class (the eight week class has units on American and Loaves/Tempeh). We also heated Indian naan bread. 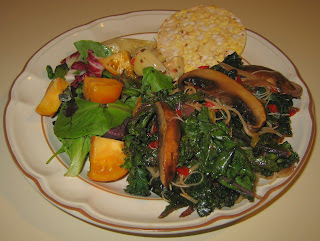 The food turned out very well, especially the salad and mushrooms. My wife and I were delighted with tonight's dinner! Yesterday, I stopped by A Southern Season gourmet food store and found Key Lime Savory Oil, key lime juice and canola oil from a company called Floribbean Foods, on clearance for $1.99 (normally I think around $8). 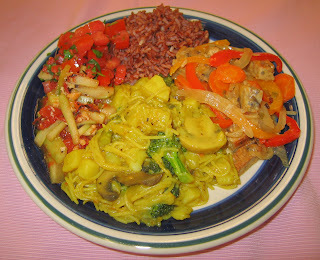 It turns out that there is a style of cooking from Florida called Floribbean that uses spicy Caribbean influences toned down with dominant integration of fresh citrus, other fruits, or coconut milk. The writing on the bottle of oil indicated that the oil could be used in salad dressings or even to cook in, and I came up with an idea that became tonight's dinner and blossomed into something even tastier than I had imagined! I started with some white basmati rice; I almost never cook with white rice, but wanted to today, to have maximum constrast for the presentation to show off lime zest. I made a simple pilaf by stir frying for about a minute or two, till kernels were turning clear, rice in the fabulously fragrant oil, adding a few pinches of cumin seeds in the last minute. Then I added one and a half times as much by volume water, brought to a boil, then simmered, covered, on low heat for about 15-20 minutes (this makes about 3 - 3 1/2 times the quantity of cooked rice as that of raw). 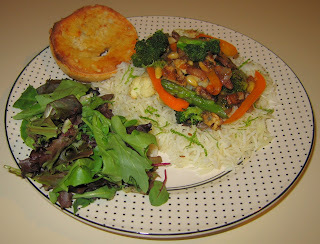 I prepared a simple stir fry with a number of ingredients, including red onion, shallot, cauliflower, broccoli, orange bell pepper, tempeh, and, added in the last few minutes, asparagus, ginger, pine nuts, and a little salt. I fluffed up the finished rice and made a cratered ring of it on each plate, serving the vegetables inside and sprinkling on along the circumference a little bit of fresh lime zest. I also served a garlic bagel. Wow, that lime oil really added an amazing citrus flavor. It all just worked well together - the flavors came together nicely and it seemed to need no additional spice or anything else. This was one of the best meals I've made recently. Wow - I'm so glad to have found this oil and look forward to integrating it into my cooking - I'm sure it would make a great marinade! By the way, a new Trader Joe's just opened about a week ago not far away in Chapel Hill. I stopped by yesterday and picked up some delicious Thai Lime Chili Cashews. I had thought of serving some with tonight's dinner or mixing some chunks into the rice, but forgot. It's just as well as I think tonight's dinner didn't need the addition - but new ideas are brewing! My wife had to commute about an hour and a half away to Winston-Salem today and yesterday, and on her way home tonight, visited with friends for dinner. So I was on my own. I had spanakopita left over from Greek cooking class last week and realized I couldn't serve it for her as she doesn't eat tofu (it upsets her stomach; I rarely eat tofu myself as it sometimes upsets mine), so I enjoyed it heated up tonight. 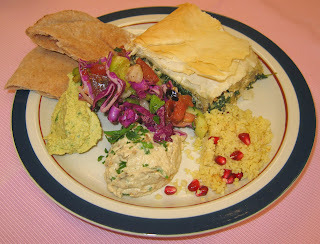 It reminded me of what a great batch my students made of the spanakopita - so tender, flaky, and tasty! 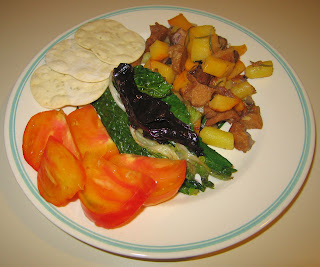 I also sauteed some Austrian Crescent fingerling potatoes with onion and anaheim pepper and had a big heirloom tomato salad with artichokes, olives, and greens. It was a good dinner! A few days ago, I bought some appealing-looking red pepper tapenade. I opened it to serve atop some whole wheat bread tonight as a side dish and was excited to read on the bottle the description of this line of Meditalia pestos and tapenades - "made possible through business partnership among Israelis & Arabs. Shared wallets lead to shared visions of the future". Not only did the product taste good (it had a nice subtly smoky flavor), but it sure does support a great cause! I am going to try to regularly purchase this company's products (apparently, their whole product line is vegan - peace begins with what we eat!). For dinner otherwise, I simply served leftovers. Greek salad was left from last week's cooking class. I heated potatoes, squash, and that very nice holiday roast with cranberries and filo from Field Roast. It was easy but very good - but my wife is saying that she misses my own cooking! I didn't cook this weekend. We had our vegetarian society's holiday party on Saturday. My wife made an Indian dish with cauliflower and potato. I made chocolate "bread" (really tastes more like a cake and has cocoa, chocolate chips - I used two or three kinds, dried cherries, hemp milk, semolina and regular flour, yeast, turbinado sugar, salt, walnuts, ... I think that's essentially it) in my bread machine. We saw the famous 2001 Japanese anime film Spirited Away on Sunday. I had seen it several years ago but my wife hadn't - and I relished seeing it again. After the film, a friend joined us for dinner across the street at Lilly's Pizza. We had pizza with vegan cheese on one half (none for my wife) and a number of toppings such as artichoke hearts and tomatoes, with a truffle oil base. They now also have vegan cheese (or cheeseless) strombolis - I had never had one of these, similar to a stuffed pizza but not quite a calzone. My friend ordered one and I loved it! I can't wait to get back to Lilly's to order a stromboli. Tonight, I made a tasty and healthy dish by sauteeing red kale with portabello mushrooms, adding soaked and drained rice noodles for the last few minutes. I served it with a crispy corn cake and salad. Normally, class 4 of 6 is Indian and class 5 is Greek, but I knew two of my students had to miss tonight, and I had a student from a previous class who wanted to make up this missed Greek cooking class for him. So I switched and went with Greek for tonight. 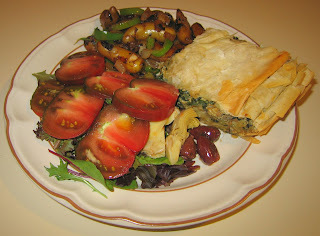 One team made excellent spanakopita with fresh spinach, a flavored pesto tofu, onions, spices, and filo dough - it was flaky and delicious. The other team worked with filo to make chocolate baklava (not shown here) - so rich and good! One team made very good "green hummus" (by mixing in parsley to the tahini, chickpeas, garlic, etc.) and the other roasted an eggplant to make a particularly good baba ganouj. We had couscous topped with pomegranate kernels and a tasty Greek salad with cabbage, oil-cured and Kalamata olives, bell peppers, and other vegetables, plus lime juice and olive oil. My wife and I haven't had many meals together at home recently, it seems. She had other things going on, and I had a film (actually two - part of the Buddhist film series, The Mountain of Signs and The Wheel of Time) at Duke University that I wanted to see, so I made a quick meal. 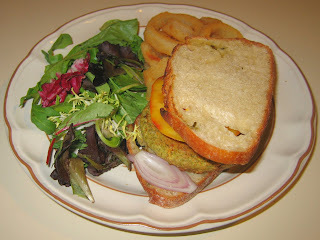 I grilled a Garden Herb Organic Sunshine Burger and served it on lemon rosemary bread, along with onion rings. We have so much leftover food from Thanksgiving and the banquet this past Sunday that I've not had to do much grocery shopping (I love grocery shopping, by the way!). Tonight, I heated tempeh still left from Thanksgiving, as well as the tagine (here you can see that it also included figs) and potatoes from the banquet. I served the potatoes in an Anaheim pepper half, and also served some Gouda style Scottish vegan 'sheese' on lemon rosemary bread (my wife skipped the sheese). It has been a while since I've cooked! I photographed a wedding this weekend and had the rehearsal and rehearsal dinner on Friday; I came home around 11p and had my wife heat up some leftovers from Thanksgiving. I had yet more Thanksgiving leftovers on Saturday; I was involved with setting my lighting gear up at the reception hall starting around 3p and returned from the wedding around 11p again. Thankfully, I love the vegan dishes that chef Robert Adams and pastry chef Lou Mincey at Café Parizäde put together, because it was their food again last night! I hosted a photography competition for my students there last night; the meal was great! The menu that I had designed with them included grilled flat breads with roasted red pepper and eggplant spreads; lentil-brown/wild rice cakes with lemon tahini; and celery and carrot sticks with hummus as starters. For main courses, we were to have had lime-marinated seared seitan with peppercorns and fig glaze; kale rollups with polenta, artichoke hearts, and seitan (but they didn't include this - which is okay, as I trust the Chef's work); a tangy Moroccan Sweet Potato Tagine; hearty exotic mushroom filo pie with fennel and spring onion confit; basil-roasted garlic whipped potatoes & mushroom-onion gravy (gravy was missing); and a hearty vegetable-barley stew. For dessert, I suggested to the pastry chef that we have plates of fruit and either my recipe for biscotti (double chocolate-cherry and lemon-currant) or one of her coconut-based cakes or chocolate pastries - she provided succulent pears and a great platter of pastries. Strangely, we were also distributing raffle prizes which hadn't yet been picked up from Thanksgiving and couldn't find a case of products from Field Roast which makes the vegan wheat-based sausages and roasts that we so love. It turns out that for some reason the restaurant cooked a neat holiday roast with cranberries and surrounded by a thin layer of filo dough that they had sent us - it isn't locally available. It tasted great! But I wonder why they used our raffle prize?! The fortunate thing is that the winner of that prize is out-of-town and told us to give it to somebody else. We don't know what happened with the rest of the case of their products, alas. Next year I think we'll require that winners of refrigerated/frozen products be present for the raffle, rather than storing the products. Anyway, it was a yummy banquet and we had a lot of fun with the pictures. 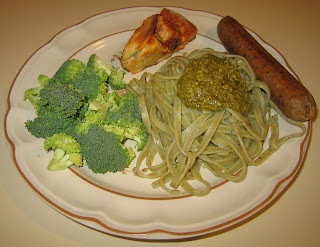 Tonight, I was on my own for dinner and made a simple meal. 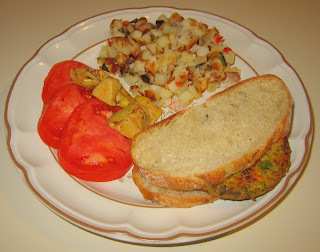 I heated Dr. Praeger's California Veggie Burger and served it with potatoes O'Brien that I had purchased frozen and simply had to cook. I also had a few of those delicious Monterey Farms' "Buffalo" variety of "Artiheart" grilled artichoke hearts that the manufacturer sent me to try.